Is it wrong to have jealousy in love? Took me a long time to understand. When I was in my teenage, my first puppy love was a total failure. I got jealous with my girlfriend quite easily, and without realising I became too over possessive and later I lost her totally. Well! 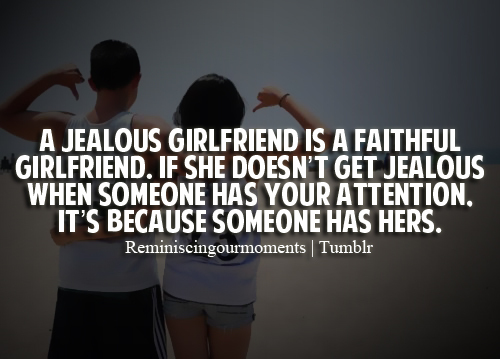 What is jealousy then? As emotions go, jealousy is neither subtle nor kind, but it is definitely complex, encompassing feelings from fear of abandonment to rage to humiliation. It strikes both men and women when they perceive a third-party threat to a valued relationship, and that distinguishes it from envy, which involves wanting something someone else has. Conventional wisdom holds that jealousy is a necessary emotion because it preserves social bonds, but it more often destroys them. And it can give rise to relationship violence. Sounds scary... Right? What about today? With a lot of understanding and knowing the true meaning of love, I have to accept love has to be borne with full trust between two persons. In trusting each other, they avoid the emotion of being jealous over one another. Jealousy usually leads to control or trying to possess another person's freedom. Jealousy ends with anger and hate. Always avoid this feeling. 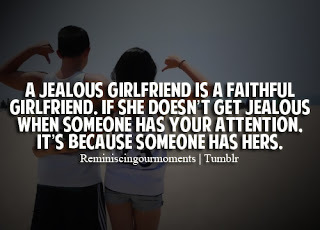 But is good to have a little jealous! When I'm with some attractive ladies around, and I could see my little darling's eyes are jealous over them because of their presence and their admiration for me, I would feel wanted. Knowing she is jealous for a short moment of time without creating any fuss, I feel great and accepted by her. Or if I came home late in the night, little darling called to see whether I'm back, indicates she has concern for me. Yes! I'm sure she must had some jealousy out of her thought, wondering why I was late. The jealousy carries some form of concern and care too. Conclusion: Isn't wrong to be jealous in love but make sure is controllable and manageable.